Hundreds of protestors took to the streets in San Francisco this afternoon to speak out against an escalating situation in Iraq in which an Islamic militant group is taking over portions of the country and killing and displacing thousands of civilians. The protestors condemned recent moves by the jihadist group, generally referred to as ISIS (the Islamic State of Iraq and Syria), ISIL (the Islamic State of Iraq and the Levant) or IS (the Islamic State), which is accused of forcing non-Muslims to flee their homes, convert to Islam or be killed. Planned several days ago, the protest occurred as the United State’s increased its involvement today in the crisis by sending military aircraft to bomb militant fighters pushing toward the Iraqi city of Erbil. President Barack Obama announced Thursday he was authorizing air strikes to protect American personnel in the city and help save thousands of displaced Iraqi civilians stranded on a mountain. Obama went on to say there have been “chilling reports” describing ISIL militants rounding up families, conducting mass executions, and enslaving Yezidi women. The peaceful protest, escorted by more than a dozen police officers, paraded by City Hall and then headed to the San Francisco Federal Building on Seventh Street, where the protestors stood en mass for nearly an hour calling for Democratic House Minority Leader Nancy Pelosi to come down from her office and explain why more isn’t being done by the United States to support the Iraqi civilians targeted by the militant group. The protestors stood out in front of the building chanting for Pelosi to speak to the crowd. Pelosi never showed, but her office sent down a statement, originally released Thursday, in which she asserted her support of Obama’s actions. The crowd briefly booed Pelosi’s refusal to address the protestors but eventually marched away from the building. There were no immediate reports by police of any arrests or incidents related to the protest. San Jose resident Fedra Vardeh attended the protest and said she wanted to be a voice for the people who have no voice. Demonstrators with the group World Can’t Wait planned a protest today at 5 p.m. to denounce the renewal of U.S. air strikes in Iraq. 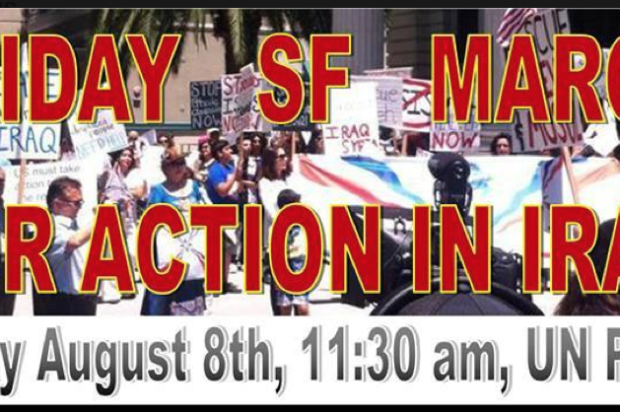 The protest will be held at the Powell Bart Plaza at Powell and Market streets. Yousefian said more should be done to stop the “ethno-religious cleansing” that is displacing people from their land and homes. She said she’s particularly disturbed by pictures coming out of the region that depict children beheaded by the group.